With a seed capital of $10 million, Amit Ramani founded Awfis in April, last year. Now the app-based co-working firm aims to create more seats and foray into new cities. 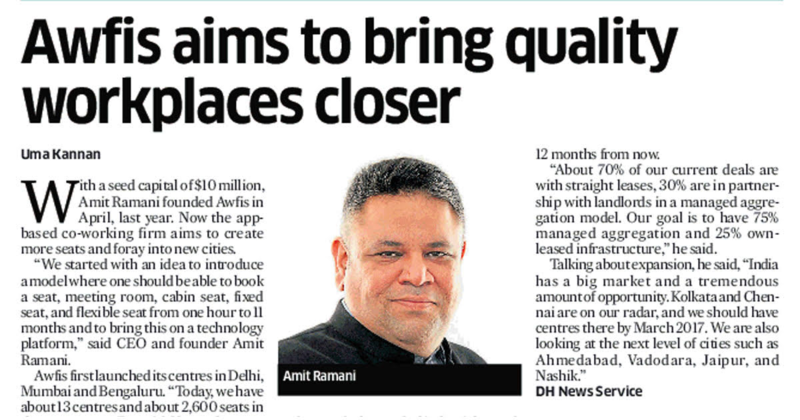 “We started with an idea to introduce a model where one should be able to book a seat, meeting room, cabin seat, fixed seat, and flexible seat from one hour to 11 months and to bring this on a technology platform,” said CEO and founder Amit Ramani. Awfis first launched its centres in Delhi, Mumbai and Bengaluru. “Today, we have about 13 centres and about 2,600 seats in those centres. By mid-November, we would create about over 5,000 seats and will add two more cities — Hyderabad and Pune. The setup offers four options — single work desks, cabin seat, which could be 2-, 4-, or 6-seater. “There is also an option of a flexible seat and one that is fixed as per one’s preference. We also have a concept of flexi-seat which is like a Starbucks environment, so you will always get a seat, but will not be the same seat, and it changes every time. And, we also have meeting room seating arrangement, and these are available in 4-, 6-, or 8-seater configurations,” he said. “Co-working and business centres both existed before we came into the market. So, we have taken the best of both worlds and created what we feel is the right product offering for what we call a ‘SMILE’ community — small, medium, individual, local, entrepreneurs — which includes startups, SMEs, corporates, and freelancers, among others,” Ramani added. While there are three centres in Bengaluru, Awfis plans three more centres soon. “We have one centre coming up on Outer Ring Road, and we are looking at Whitefield too. The centre will come up by March, next year. We will have 10,000 seats in seven cities, and we would have centres within a 10-minute-drive radius in seven cities across India, by March, next year,” he added. Awfis, which enjoys 82% occupancy, will double its capacity in the next six months, and plans to again double it in 12 months from now. “About 70% of our current deals are with straight leases, 30% are in partnership with landlords in a managed aggregation model. Our goal is to have 75% managed aggregation and 25% own-leased infrastructure,” he said. Office vacancy in Bengaluru was reported at 4% in 2015, the least among top cities in India. This was also a new low for the city, which had marked office vacancy at 16% in 2011. The city took in net leasing space of 12.3 million sq feet, surpassing the previous record of 11.3 million sq feet set in 2007. However, as a breeding ground for startups, the city has found its coping mechanism, and how! The startup capital of the East is bridging this gap, while also enabling the confluence of the startup and corporate communities, with coworking spaces as the answer. “Overall, coworking is not a new concept. It has approached centre stage only in the last 1-1.5 years, but has been around as a concept and as reality in various cities across the globe for over 3-4 years,” said Ravindra M K, Co-founder and Marketing Head, BHIVE Workspace. Bengaluru-based workspace solutions provider BHIVE Workspace currently operates centres in Indiranagar and Kormangala. Ravindra said, while startups form the largest pie of consumers, they alone cannot drive activity and growth in the coworking space. Among consumers, coworking spaces have received interest from professionals, SMEs and even corporates. He believes that it is the corporates that have more to gain from coworking spaces. “Corporates stand to gain perspective in the form of inspiration, opportunity for collaboration, and most importantly a ‘reality check’,” he said. Housed in silos, far away from the hub of the city, corporates generally have an air of sobriety and order. And, today, in the age of startups, disruption is the order of the day. “For corporate employees, working out of a coworking centre gives them much-needed opportunity to reconnect themselves with innovation, creativity and disruption. It brings them out of their shells,” said Ravindra. Even with their swanky, fully-equipped, king-sized offices, corporates are consuming nearly 30% of the space in coworking setups. Studded by young and thriving professionals, these centres boast of a spirited atmosphere that are sure to get one’s juices flowing. While 25% of the space at Awfis’ centres are occupied by startups, up to 30% is occupied by SMEs and another 30% by corporates. Awfis, a workspaces company, provides ‘Just in Time’ solutions, which offers customers the facility to book and pay for inventory anywhere across the country through a mobile application available on the Android and iOS platforms. “India is currently witnessing a revolution in the startup and entrepreneurial culture, triggering a rise in the mobile working population. We are in the process of creating work spaces and meeting rooms that will enable users to find a space within a 10-minute driving distance across all major metros. The anytime, anywhere network of spaces will provide the ability to work near home to the young Indian workforce,” said Amit Ramani, Founder and Chief Executive Officer, AWFIS Space Solutions. “Our attempt is to try and become the Uber for office space real-estate,” the CEO said. With a cumulative capacity of 1,500 seats, Awfis currently operates a centre each in Bengaluru, Delhi and Mumbai. The company is set to take this number to 10,000 seats by the end of this year. 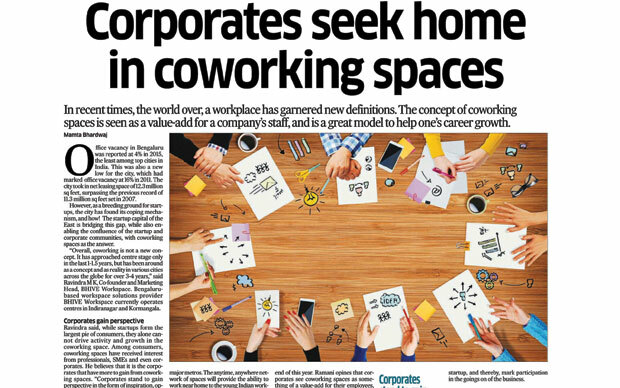 Ramani opines that corporates see coworking spaces as something of a value-add for their employees, and offer it as a perk. Location, proximity and a non-traditional approach to the arrangement of the office itself, make them desirable venues. Solutions in this space are by and large camouflaged as incubation centres, and it must be noted that incubation centres are not pure play space solutions. More often than not, they own some stake in the startup, and thereby, mark participation in the goings on of the business. “For a startup community, the virtue of the ecosystem, which the coworking space offers, in itself is of supreme importance,” said Manoj Chandrappa, Co-founder, TechHub. TechHub, with centres in seven cities across the globe, including one in Bengaluru, creates spaces around the world for tech entrepreneurs to meet, work, learn and collaborate. Even for corporates, he said, in spite of having their own innovation hubs and labs, it is for the sheer novelty that coworking spaces offer that they are regarded as superior. With the trend catching up, corporates are expected to increase their share in consuming coworking spaces. 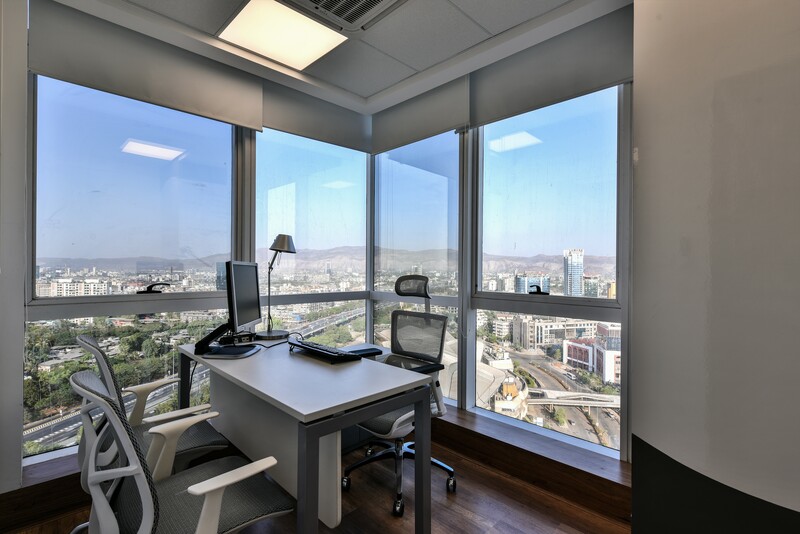 “If not for work stations, corporates across the city have been found using coworking spaces for brainstorming sessions, meetings and conferences. This is definitely a growing trend,” he said. In a major push to the Indian coworking space ecosystem, New York-based $15 billion coworking space giant WeWork recently announced its plans to enter India this year. WeWork Enterprise Sales Project Manager Oscar Mattsson from New York said the company is thrilled that many startups are thinking of joining WeWork community. “I’m here to provide more information on beautiful workspaces, learn more about client-specific business needs, and schedule a tour at preferred locations,” said Mattsson. Virtuous Retail, owned by Xander Group is also found to be in the fray.